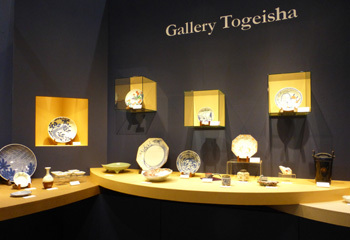 In 1946, "Ginza Togeisha" was founded in Ginza, a center of Tokyo, selling modern and antique porcelain including Imaemon works. In 2004, we changed "Ginza Togeisha" to "Gallery Togeisha Co. Ltd." to start running a gallery of modern paintings and Antique porcelain. In 2011, we moved our gallery from Ginza to Sangenjaya in Tokyo and shifted its focus to specialize mainly in Antique porcelain. In parallel, since 2011, we have been participating in "Art Fair Tokyo" at Tokyo International Forum. 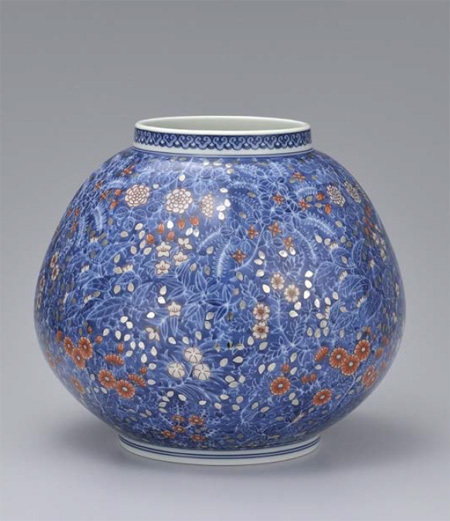 We provide consultation to those who are thinking of establishing collections of Japanese antique porcelain or those who have already started collecting. We also advise those who are going to sell their collections or inherited works of art. Born into the porcelain world as I was, my father was Genyu Imaizumi, a renowned collector and connoisseur and my cousin was late Imaizumi Imaemon XIII. I have been surrounded and shown hundreds of Nabeshima and Ko-imari masterpieces from the childhood. Thus, my discerning eyes for genuine pieces have been gifted. After graduating from University, I became a visiting researcher in 1971 at Ashmolean Museum in Oxford University to help Dr. Oliver Impey (1936~2005) who was a senior curator at the department of Eastern Art of Ashmolean Museum by sorting out and numbering many sherds from various old kiln sites from Arita area. 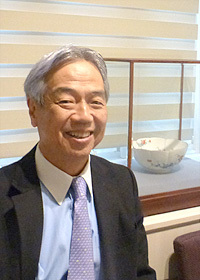 During my time at Ashmolean, I became acquainted with pioneer Japanese porcelain collectors. I also visited many English country houses to conduct a research on their Japanese porcelain collections. In fall of 1972, I started working at Christie’s London office’s Asian art department to cover all sorts of Asian works of Art for a year. In 1973, I went back to Tokyo and started running our family company called "Ginza Togeisha." Since then, I have been to Japanese Art sales at various auction houses. I have bought back a lot of Kakiemon and Ko-Imari porcelain which were exported to Europe from the 17th to 18th century through the Dutch East India Company and also Nabeshima wares which were brought to the West after the Meiji era. I sold them to both public and private museums as well as private collectors. I recognize myself as a leading dealer and connoisseur on this field. Iro-Nabeshima（porcelain with multicoloured overglaze enamel）by Imaemon is created on the basis of techniques dating back to the Edo period (mid 17th century). These techniques have been preserved for about 370 years. Characterized by a distinctive gracefulness, the Imaemon coloured porcelain is greatly appreciated by people today. Its superb techniques preserved at Imaemon kiln have been designated as an Important Intangible Cultural Property of Japan. The mission of Imaemon is to pass the art of handicraft at the Shogun era down to posterity and make people’s daily lives better and more enjoyable with our coloured porcelain. These are our fundamental philosophies. Tradition does not just mean maintaining old techniques, but also means using all techniques to create new values for today. Based on these philosophies, Imaemon kiln produces two styles of porcelain: works of Imaizumi Imaemon XIV, which pursue the grace of modern Imaemon, and works taken over from the traditional Iro-Nabeshima style of the Edo period. Day by day, the creative works at Imaemon are continued in the hope that the art will help preserving genuine Japanese culture, such as appreciating four different seasons and people’s link with heartwarming hospitality for each other with our fine porcelain.